Digbeth Oktoberfest returns for its fourth year! 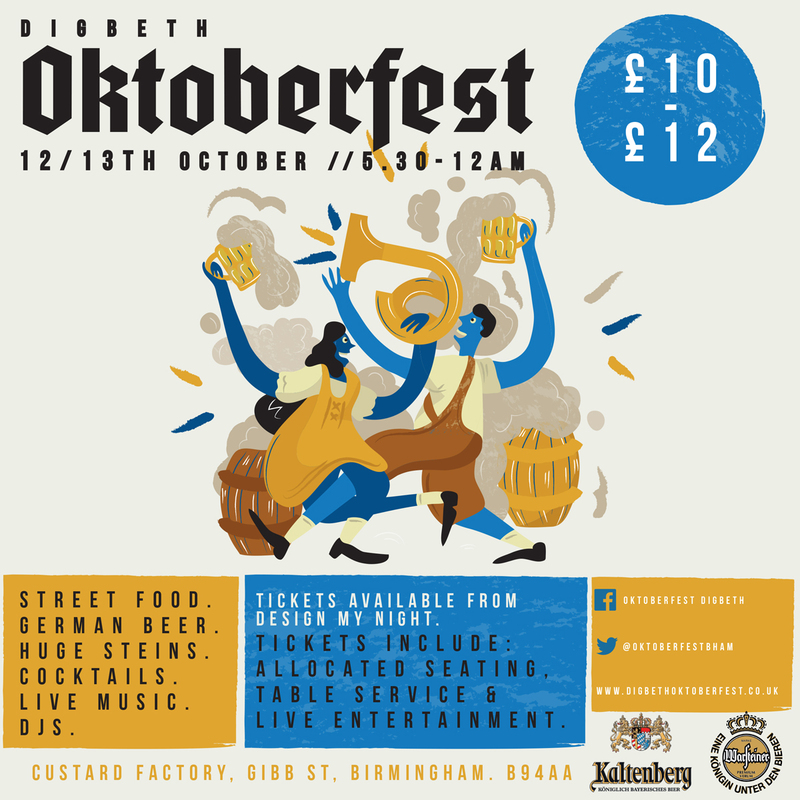 Digbeth Oktoberfest returns for its fourth year – bigger, better and more bavarian than before! Fancy a trip to Germany this winter? Seasonal Markets and the team at The Old Crown have got you covered. Join us on the 12th and 13th October 5.30pm-midnight for our fourth annual Digbeth Oktoberfest. We feel like we’ve outgrown our home at The Old Crown, so this year, we’ve flown the nest to the newly renovated Custard Factory. Our brand new Bavarian beer hall is just a stone’s throw away, with even more space for an Oktoberfest like no other. Our new venue will be decked out in the ever-traditional decor, with bench seating and table service for even more guests per night. The Old Crown & Seasonal Markets team have curated a drinks offering like no other, with something for everyone not least seasoned beer enthusiasts and Bavarian beer buffs alike… This year we’ll have beers from 3 Bavarian beer heavyweights: Erdinger, Kaltenberg & Warsteiner. Years of experience, traditional hops and grains and time-old recipes for brewed perfection and we can’t wait. Beer not your thing? Not to worry, Oktoberfest 2018 will see well stocked bars with German gin, German wines and Oktoberfest themed cocktails. Alongside our drinks offering, we thought we’d throw in a good couple of street food vendors to bring some Bavarian specials to the table – think Bavarian burgers, BBQ bratwurst, apple strudel waffles & the like. We’re fully capitalising on the wealth of street-food talent in brum to bring some off the chain German specials exclusively available at Oktoberfest 2018. Throughout the evening there will be a full line up of entertainment from DJs, live bands and a few traditional Oktoberfest games. We will also be holding a best dressed competition for those that wish to embrace all that is Oktoberfest and don the lederhosen for the night. If that’s not for you then just get your glad rags on and get ready to dance the night away standing on a bench, swinging your stein! At Digbeth Oktoberfest 2018 we are by no means scrimping on the décor. You can expect to find the iconic Custard Factory fully transformed into German beer hall complete with a wooden Bavarian lodge stage, meters and meters of draped fabric, hop garlands and bench seating. Tickets cost £12 (early birds tickets available for £10) which gets you entry to Digbeth Oktoberfest, reserved seating, a full line up of DJs, bands and entertainments, bars and street food. An event like no other, a unique, immersive experience to relish with a bunch of your friends, on your own, part of an office outing. Drop an email to digbethoktoberfest@gmail.com to find out more about additional extras and group bookings.